Just to prove that, occasionally, I still paint and draw. 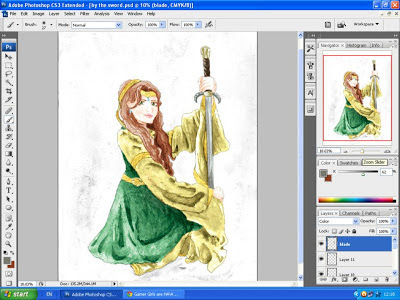 A few years ago, I found a tutorial by Jenny Dolfen, where she painted a picture with black watercolour, scanned it, and used photoshop to add colour. I really wanted to the method, so I painted this (based on a photo of a friend of mine at Medieval Mdina), and am slowly painting it. 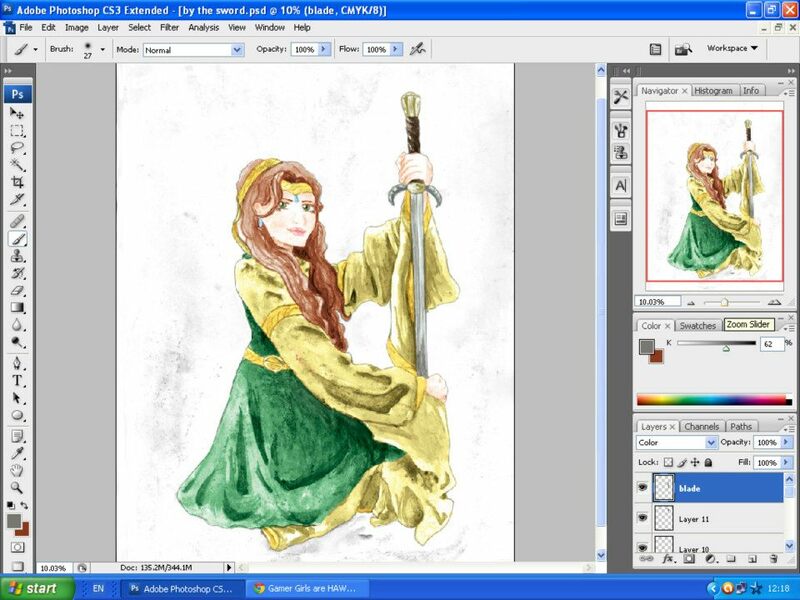 The method involves creating new layers on top of your watercolour, and setting them on either 'color' or 'overlay'. This helps you to retain the brushstrokes and texture of the paint. So far, I've only laid down the base colours, and need to do some more detailed shading e.g. the blush of her cheeks, add some more greens and yellows to the dress. If any of you watchers are good with Photoshop, i would love to hear your advice. Also, the tutorial I based this on doesn't seem to exist any more-does anyone know where I can still find it? I also did a few fashion drawings a few months ago. 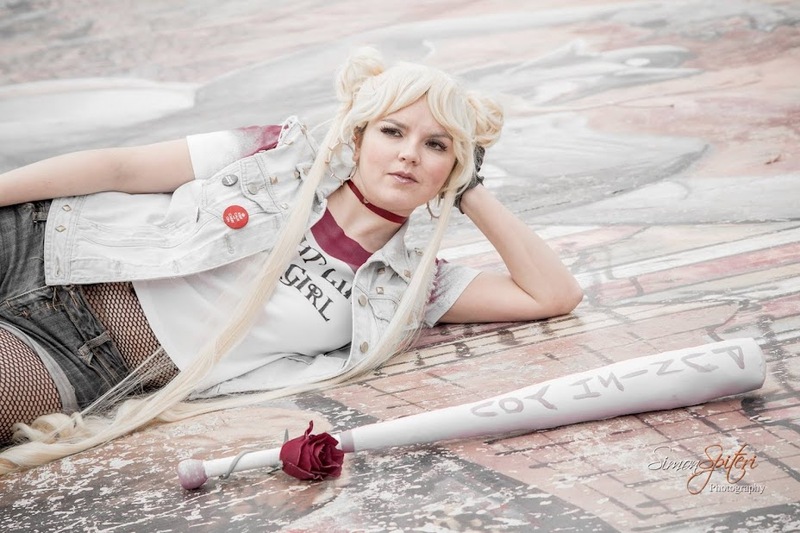 I don't know whether I uploaded them, so here they are. 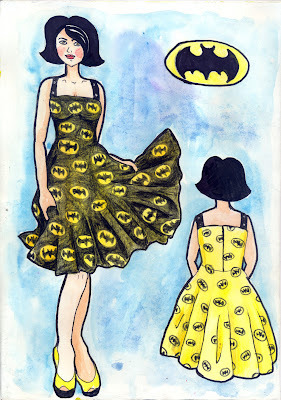 A Batman themed dress. I have the material to make the black one, and it's available as a custom made item on etsy. 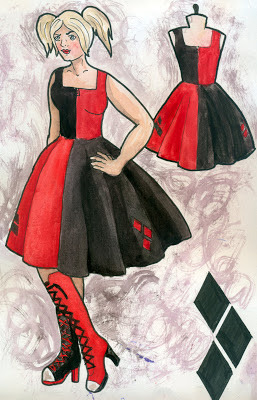 This is a Harley Quinn themed dress. I haven't put the dress up for sale on etsy because I'm still not sure what material would be best for this dress.